Despite leaving Italy just over a week ago and returning back to work, I can still feel the presence of our family and friends we left behind. This whirlwind of a trip was both an opportunity for our girls to learn more about their roots and to further expand their appreciation of Italian art and culture. Just under four weeks were spent in regions that provided the pleasures of visual and culinary lessons; and so I begin the first of many posts to come with our last destination - ROMA. This is a city that finally grew on me after my second visit in 3 years; a city that with my first visit left me speechless. I was brought back to familiar grounds but with a different quarter to explore and understand. It reunited me with my youngest cousin, giving her the opportunity to meet my family and became a destination point for a meet up with one of my Cucina Conversations fellow bloggers and friend - Maria Luisa at Marmellata di Cipolle. She travelled all the way from Calabria to her favourite city and spent a day with us, which I am so grateful for. It also provided some culinary experiences that cannot all be written in one post, but will share this one cooking session organized for the whole family. We departed Rome feeling we could have stayed a little longer if we had the time. Here I post a few of my favourite captured parts of this city at its quietest; share a family cooking experience had with friends from Latteria Studio and cook these delectable buns, a twist to a Roman recipe for Maritozzi. Quarters of Rome previously unexplored and a cooking class scheduled for the family was a welcome change to the sightseeing and touristy things one cannot do without in this grand city. It was my intention to end our whirlwind of a tour in the Eternal City, with a Market to Table cooking experience shared with the family in the Trastevere region of Rome. It had been just over three weeks since we had stepped into a kitchen or cooked a meal and we were all looking forward to a family cooking day with Alice Kiandra Adams - food stylist, owner and creator of this inspiring space at Latteria Studio along with Carla Tomasi, cook extraordinaire - chef, former London restaurateur, passionate gardener, and preserver...to name a few. The day began with meeting Alice for a morning coffee before heading to the market, it was like meeting a long-time friend. This down to earth Aussie girl had the whole family at ease - heading to one of her favourite small outdoor local markets at Via Niccolini not far from Latteria Studio to buy produce for our cooking 'masterclass' along side Carla Tomasi. We had been given the choice of visiting the famous Testaccio market, but I opted for the smaller market suggestion for our experience. Supporting local producers is very much Alice and Carla's mantra; growing a lot of vegetables in their very own kitchen garden, so this felt right. As I select these photos, I recall the light-drenched studio on a somewhat overcast day, admiring the array of colourful produce effortlessly arranged by Alice. I remember the wonderful cooking tips that Carla imparted as she lavishly brushed olive oil on the the hot focaccia she had just taken out of the oven and sprinkled with fresh herbs after baking NOT before. 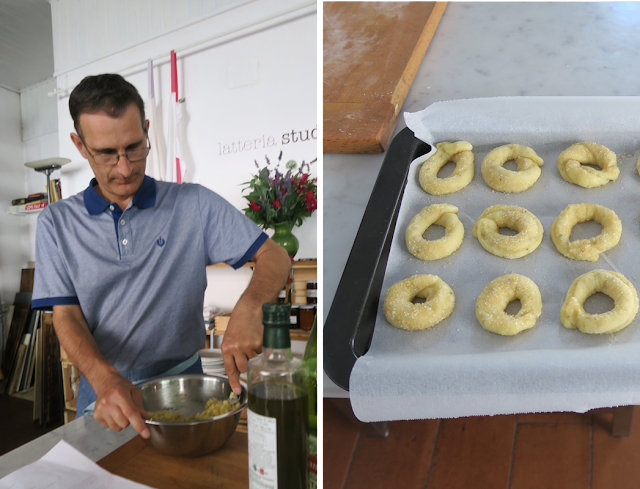 The fried zucchini flowers that made up our entree` were coated in a batter that included some olive oil, a tip to keeping them crisp longer which were enjoyed with a glass of vino bianco frizzante, all while prepping our contorni (sides). We were too busy cooking, eating and talking that we didn't snap any photos at the table nor of the plated pasta dishes shared. The familiar cavatelli had the girls taking control, while the not so familiar lombrichelli made with a ridged rolling pin had us wondering why we ever needed a pasta machine when it was so easy and far more enjoyable using implements that our nonne once used. The meal ended with ciambelline al vino, cherries, apricots and donut peaches. May I add, despite requesting a vegan lunch some fresh mozzarella and pecorino cheese was also purchased for the non vegan husband, who slowly found his mojo in the kitchen with the making of these sweets. Oh, and what we hadn’t planned for were the warm and delectable maritozzi that Carla had waiting for us on arrival. We were very curious to find out how a non vegan recipe for these familiar soft buns from Rachel Roddy’s book Five Quarters, were made. According to Alice and in her own words: “These were something of a revolution for Carla and I...so light and bouncy". Well ... our whole family thought so too! All recipes were kindly supplied by Alice and Carla, and for the seasonal dishes enjoyed on the day along with tips learnt, we will cook in due course when our summer ingredients come into season before I post about them. Makes 10 large, or smaller buns. Make a sponge mix by mixing the flour, yeast and sugar with 250 grams of warm water and letting the yeast take action and start bubbling away before adding the rest of the ingredients. This usually takes roughly 10 minutes. Place flours, sugar and pinch of salt in a suitable mixing bowl and mix. Add the lemon zest and dried fruit if you wish, drizzle in the vegetable oil and then pour in the sponge mix that has developed. On a cold day make sure the water is on the warm side. Mix by hand or with a dough hook in a stand mixer. Turn dough out, knead for a few minutes, place in a clean plastic or glass bowl and cover with plastic film. Leave to rise until it has doubled in size, which depending on the room temperature may take up to 2 hours. 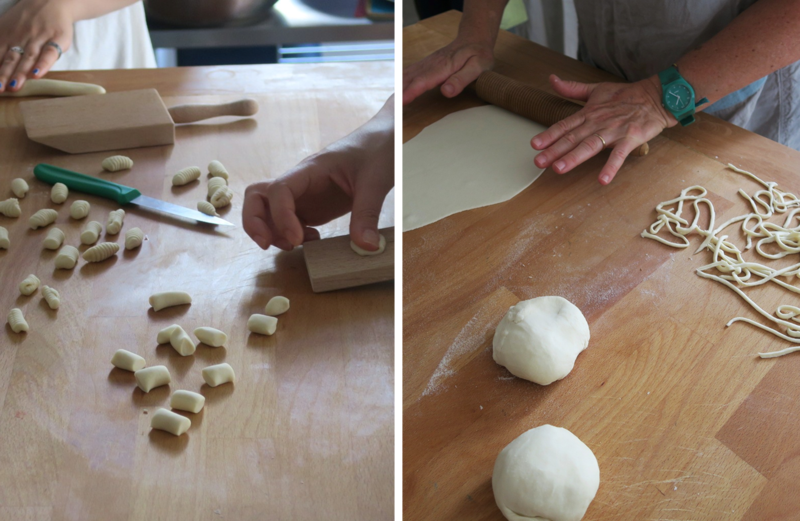 Gently deflate the dough, knocking it back a little and then dividing it into about 10 pieces – more if you want mini maritozzi. Shape each piece into a traditional cylinder shape or as I have in balls and leave to prove on a baking tray lined with parchment paper. Cover with a cloth and wait until they doubl in size. Preheat the oven to 180°C with fan. Bake for about 15 minutes or until golden brown. While baking make a simple sugar syrup by boiling one part water to one part sugar. Once the buns are out of the oven, brush lightly with sugar syrup. For more information about Market to Table cooking sessions visit their events page, or keep up to date with their delicious food cooked on both their Instagram feed @carla_tomasi and @alicekiandra.adams. Alice also has a blog showcasing her food styling, a collection of recipes and more.